So the band is rockin', it's your turn to solo, but guess what? You forgot your instrument! No matter - you've got a six-pack of Tuned Pale Ale Beer, the brew that inspires musicality. Well, kinda. Tuned Pale Ale - and really, we can't make this stuff up, folks - is a beer aimed at musicians, or at least those people who have tooted the top of a bottle and thought, Hey, that sounds great...I wonder what key I'm in? Tuned Pale Ale features notes on its bottles which makes it easy to understand. Drink 1/3 of the beer and you're in F. Down half and you're in D (well, actually, from the above photo it looks like you're in C#). And when the bottle 1/3 full, you're pretty much in A. 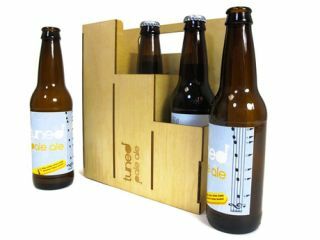 According to the Tuned Pale Ale website, the beer is "a product that explores the musical affordances in everyday objects and promotes social spontaneity. While drinking beer, people become musically encouraged and often start making music with objects around them. This product aims to promote more of this type of social interaction. This product aims to inform users about the musical qualities of existing bottles and to make the bottle a better instrument." Unfortunately, however, only a limited amount of Tuned Pale Ale was produced and the beer is no longer being manufactured. But the makers are seeking larger brewing and distribution options. If you have deep pockets and just love the idea of promoting musical interaction through beer drinking, you can contact them here. Many people in the world will thank you for it...whether they know it or not.